New data shows how emergency rooms take advantage of their market share, at the expense of their patients. Around 1 am on August 20, Ismael Saifan woke up with a terrible pain in his lower back, likely the result of moving furniture earlier that day. Saifan went online to figure out where he could see a doctor. The only place open at that hour was Overland Park Regional Medical Center in his hometown of Overland Park, Kansas. The doctor checked his blood pressure, asked about the pain, and gave him a muscle relaxant. The visit was quick and easy, lasting about 20 minutes. But Saifan was shocked when he received bills totaling $2,429.84. The bill included a $3.50 charge for the muscle relaxant. The rest — $2,426.34 — was from “facility fees” charged by the hospital and doctor for walking into the emergency room and seeking care. Because Saifan’s health spending is still within his plan’s deductible, he is responsible for the entire amount. There are 141 million visits to the emergency room each year, and nearly all of them (including Saifan’s) have a charge for something called a facility fee. This is the price of walking through the door and seeking service. It does not include any care provided. Saifan’s bill was so expensive, it turns out, because the hospital used the facility fee typically reserved for complex, intensive emergency room visits. Emergency room facility fees are usually coded on a 1 to 5 scale, to reflect the complexity of care delivered to the patient. Saifan’s visit where he received a muscle relaxant was coded by the doctor as a level 4 visit — the second highest — and came with hefty fees as a result. The hospital billed a separate facility fee and chose level 3, typically reserved for moderately complex visits. 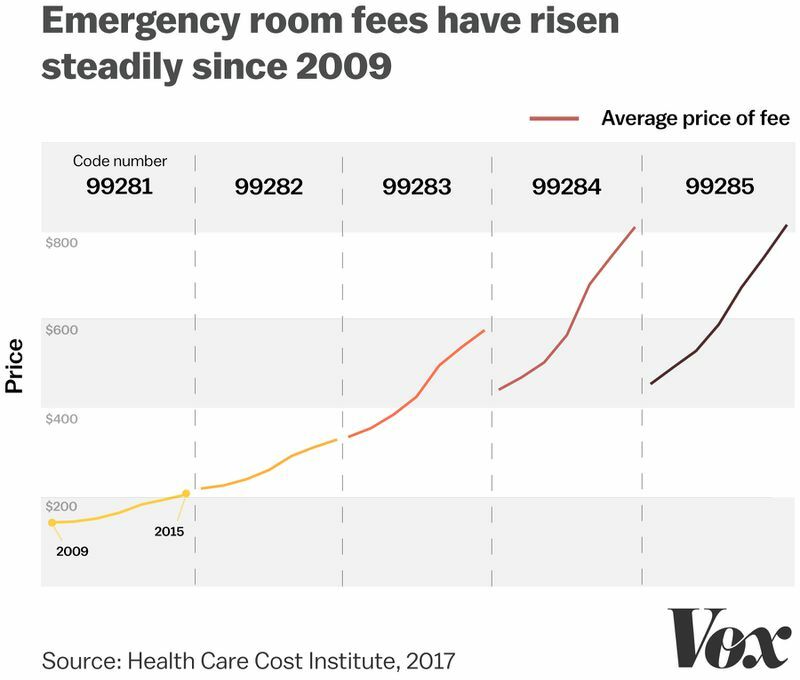 Saifan’s experience isn’t an anomaly: A new Vox analysis reveals that emergency rooms all across the country are increasingly using these higher-intensity codes, and that the price of these codes has increased sharply since 2009. Vox worked with the nonprofit Health Care Cost Institute (HCCI) to analyze 70 million insurance bills for emergency room visits from between 2009 and 2015. We focused on the prices that health plans paid hospitals for facility fees, not the hospital charges (which can often be inflated well above what patients actually pay). We found that the price of these fees rose 89 percent between 2009 and 2015 — rising twice as fast as the price of outpatient health care, and four times as fast as overall health care spending. 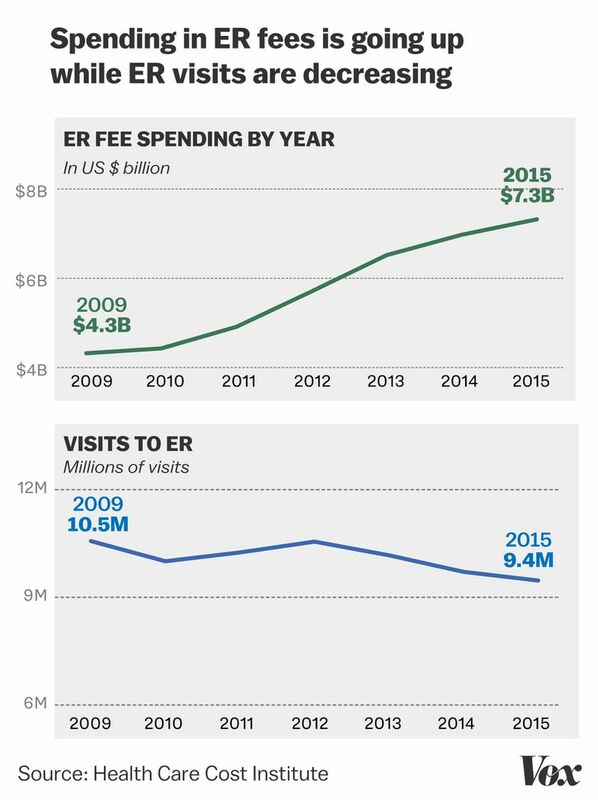 Overall spending on emergency room fees rose by more than $3 billion between 2009 and 2015, despite the fact the HCCI database shows a slight (2 percent) decline in the number of emergency room fees billed in the same time period. The HCCI data shows that prices are rising dramatically and that, increasingly, hospitals have gravitated to using the most expensive billing codes — the level 4 and 5 charges, typically reserved for the most complex visits. Hospitals argues that these increases are due to an aging, sicker population. “The number and complexity of ED visits continues to increase — this trend is not surprising given current population and health care-related trends,” Ashley Thompson, senior vice president for public policy at the American Hospital Association, said in a statement. But experts on emergency billing argue that this is evidence of hospitals taking advantage of their market power — charging high fees because they are often the only place, late at night or on the weekend, where Americans can seek health care. David Overton knows what strep throat feels like. He comes down with it once or twice every year. He typically goes to urgent care or a drug store clinic when his achy throat and fever symptoms start. But his most recent strep throat infection flared up on Memorial Day, and those clinics were closed. So he went to Legacy Emergency Room & Urgent Care outside of Dallas. Overton walked in the door for urgent care, but staff there said his case was severe enough to move him to the emergency room side of the clinic. The emergency room performed a CT scan and used IV medications to treat Overton. He immediately felt better, and left with a prescription for antibiotics. Three days, later he saw another doctor who confirmed it was a simple case of strep throat. But because of the complex intervention — the CT scan, the IV drugs, the long visit — the hospital coded Overton has having the most complex visit possible, a level 5. They billed him a $1,900 facility fee. Because he has a high-deductible plan, he’s responsible for all of it. He’s currently paying off the bill by $50 each month. So far, he’s paid $300. Emergency billing guidelines offered by the American College of Emergency Physicians typically reward doctors for providing a higher level of medical care. They instruct hospitals to use the more expensive billing codes for cases where they have to perform multiple scans and examinations. Two different hospitals trips for the same condition may be treated and billed quite differently. A case of strep throat treated with oral antibiotics — a simple visit — would likely be coded as a level 1 or 2 visit. But a visit with multiple scans and an IV drip could come out to a 4 or 5. The HCCI data set suggests that Overton’s experience may not be atypical. It shows that more and more emergency rooms are billing the severe, expensive facility fee charges. What’s more, there are no federal guidelines on how to code even the exact same visit. This is left up to a hospital’s billing staff, meaning that if two patients receive identical care in different emergency rooms, one may be coded as a level 3 and another as a level 4. These discrepancies can be expensive for patients, as emergency rooms charge hundreds of dollars more for the more severe codes. The HCCI database shows that the average price of a level 3 facility fee (in medical coding, this is billed as 99283) is $576. Go up to the next severity code, level 4 (or, in medical codes, 99284), and the price rises to $810. The price of facility fees has risen steadily in recent years. A level 3 code (99283) now costs, on average, $576. A level 4 code (99284) averages $810. “Hospitals can make a lot of money charging for all the extras — CT scans, MRIs, laboratory fees, even starting an IV,” Derlet, the emergency physician, says. In 2009, 50 percent of all emergency room facility fee charges were for level 4 and 5 codes. In 2015, that number rose to 59 percent. How to interpret that trend isn’t fully clear. Some say it could signal hospitals charging higher rates for similar care. But the current data makes it impossible to rule out the fact that emergency room visits may just be getting more serious. Medicare tried to simplify facility fees. It failed. The government has tried to crack down on high emergency room fees before — but ultimately was scared off by intense push back from health care industries. In 2012, an investigation by the Center for Public Integrity showed that hospitals had earned an additional $1 billion in Medicare revenue by using the most expensive facility fees — the level 5 codes. This meant that the public insurance program that covers Americans over 65 was suddenly spending significantly more money on these routine fees. In response, the Obama administration proposed eliminating the facility fee levels entirely, to get rid of any incentives to bill for a higher price. It suggested one flat fee for all visits. “A single code and payment for clinic visits is more administratively simple for hospitals and better reflects hospital resources involved in supporting an outpatient visit,” Medicare argued in November 2013. But that rule never saw the light of day. After intense pushback from hospitals and doctor groups, the issue was dropped and the fee levels remain today. At the time, Medicare issued a statement saying it “intends to consider options to improve the codes for these services in future rulemaking.” So far, the agency has taken no actions to re-regulate these codes. Some patients, however, have had success taking matters into their own hands. Last winter, John Shelbourne ended up with a small gash above his eye from a basketball game with friends. The doctors at Swedish Covenant Hospital glued the wound shut and covered it with Steri-Strips. Shelbourne estimates the visit took about 15 minutes. Shelbourne’s visit was coded level 3, a medium-intensity facility fee. He showed the bill to his father, a doctor. Shelbourne started calling the hospital, arguing that his visit should be coded level 2 instead of 3. He made 25 separate calls over two months. He kept records of all of them, on sticky notes around his desk at work. The hospital eventually agreed with him and lowered his visit from a level 3 down to a level 2. That change lowered his portion of the bill from $441 down to $305. Saifan, the engineer in Kansas who received the $2,429.84 bill for the muscle relaxant, is disputing his bill as well. “We’ll see how the dispute goes, but I’m not expecting it to change,” he says. He says the hospital told him he could get a 10 percent discount if he paid the bill in full rather than installments over time, which he’ll do if his dispute is unsuccessful. His family has enough money to pay off the bill.